If you’re a regular visitor to Cracking the Cover, then you might have noticed the sudden onslaught of fantasy reviews. It doesn’t happen often, as I tend to like a variety of genres, but here we are. One of the benefits of reviewing so many fantasies so close to each other is the ability to compare and really flesh out what you like. In the case of Wicked Saints, the first book in Emily A. Duncan’s Something Dark and Holy series, comparison went beyond fantasy — it’s the second book I’ve read in the past two weeks that features blood magic as a major element. It’s hard to describe Wicked Saints in any more detail than the synopsis above without giving away information. Wicked Saints isn’t a straightforward novel, and that’s why it works. Author Emily A. Duncan gives tiny nuggets of information in short bursts throughout. Though Wicked Saints is set in its own world, the setting has an almost Russian feel to it. Emily’s world building is visceral, which adds to the overall ambiance. 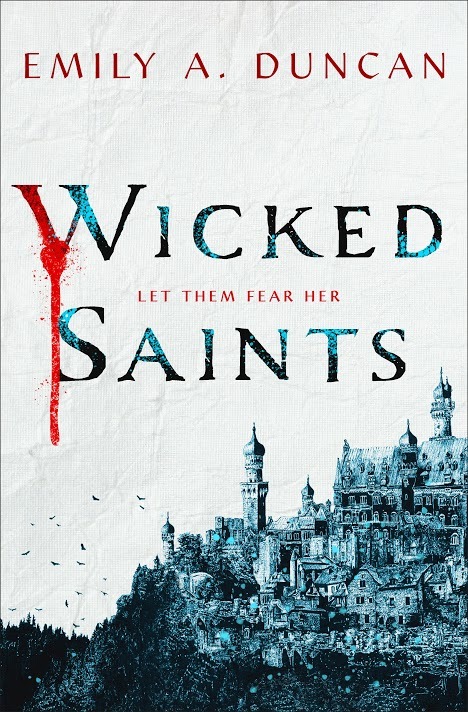 As good as Wicked Saints is, it’s not for everyone. It is very, very dark. And while I’m glad I did read it, I don’t know that I would have stuck with it had I not been taking part in the blog tour. Editor’s note: Due to the dark elements throughout Wicked Saints, I recommend it for readers 14 and up.